• You are unable to access the web-based setup page due to a lost or forgotten password. • You are unable to acquire an Internet connection even after performing a firmware upgrade. • You want to recover your Internet connection after experiencing a power outage. To perform a hard reset on your device, press the Reset button of the device. For older models, you may need to press the button for 30 seconds. For newer models, you need to press the Reset button for five (5) seconds at most. You may use a pin to easily press the button. 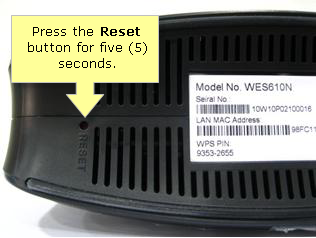 IMPORTANT: The location of the Reset button may vary depending on the model of the device being used. Refer to the following images for examples. Access the web-based setup page of your bridge or media connector. QUICK TIP: To determine if your device is a wireless–G or wireless-N type, refer to the model number of your device. If the last character of the model number ends in N, then it is an -N device. The same thing applies for A, B, and G devices. On the web-based setup page, click Administration > Factory Defaults. 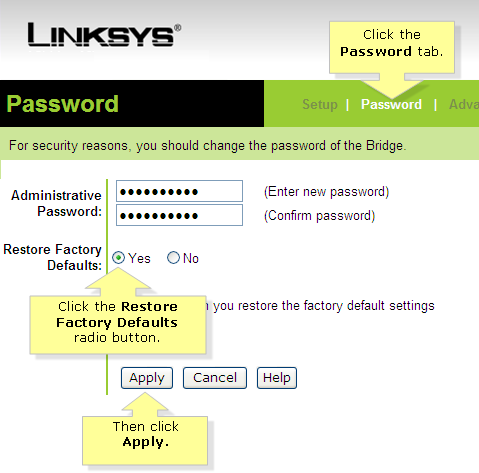 Click the Restore All Settings or Restore Factory Defaults button to perform the reset. Your device’s default settings should now be restored.